Your individual user account gives you complete access to a number of our services, including the ECG Reading Room, ECG Tracker, High-Yield ECGs, and ECG Criteria for Common Abnormalities. ECG Reading Room. The ECG Reading Room is currently comprised of a database of 531 unique electrocardiograms (ECGs) with more tracings being added monthly. We are the largest online resource available for ECG education. Once you complete all of the ECGs in our database, the electrocardiograms will continuously recycle, enabling you to interpret thousands of tracings over years of training. Whether you study for hours at a time, or just work one ECG at a particular setting, you answer each ECG using a scoresheet similar to that used for the American Board of Internal Medicine Cardiovascular Disease exam. Once you code your answer, you receive immediate feedback from a panel of ECG experts regarding the accuracy of your diagnoses. 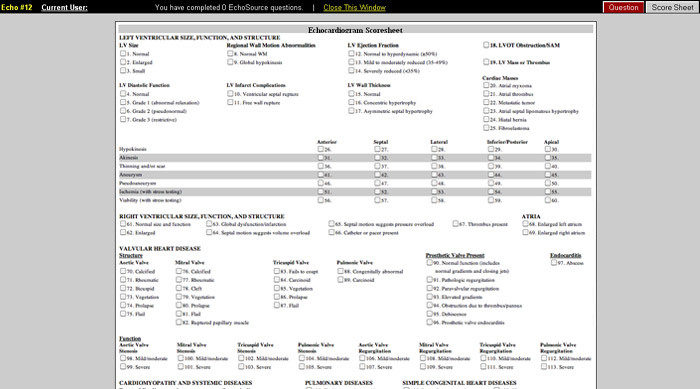 The expert panel also provides you additional teaching points specific to every ECG that you complete. ECG Tracker. The ECG Tracker enables you to keep a record of all the ECGs that you read. To track your own progress, you receive a score for each completed ECG, and this score is displayed as a percentage of the maximal number of points that the expert panel feels can be earned for each tracing. You can later go back and review each ECG an unlimited number of times for your own education. High-Yield ECGs. This concise database is a supplement to the more extensive ECG Reading Room. 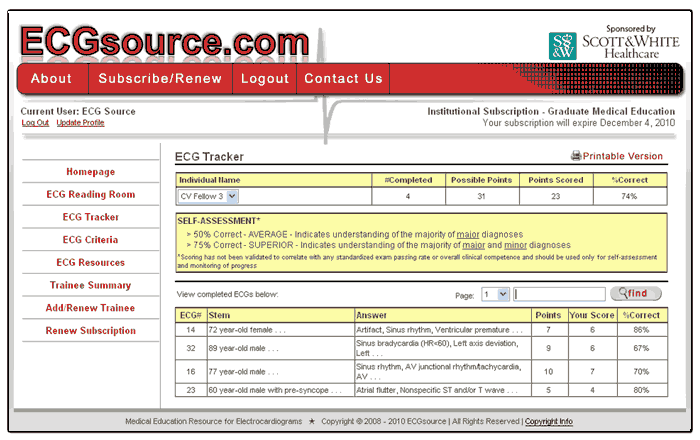 Although ECGsource is in no way affiliated with any medical testing organization, ECGsource has years of experience in medical exam preparation and has compiled a high-yield database of the types of ECGs that may commonly be tested. These high-yield electrocardiograms are meant to assist you in a last minute review prior to taking standardized medical examinations. ECG Videos. Over 45 minutes of electrocardiogram tutorial videos are now available. These videos provide an overview of electrocardiogram basics and certain commonly seen diagnoses, including the determination of the rate, rhythm, and axis, as well as understanding the conduction system, the limb and precordial leads, bundle branch blocks, left ventricular hypertrophy, and more. ECG Criteria for Common Abnormalities. This compilation of standard criteria for electrocardiogram abnormalities is a perfect resource for both the novice and expert in ECG interpretation to use as a quick reference. CathSource. 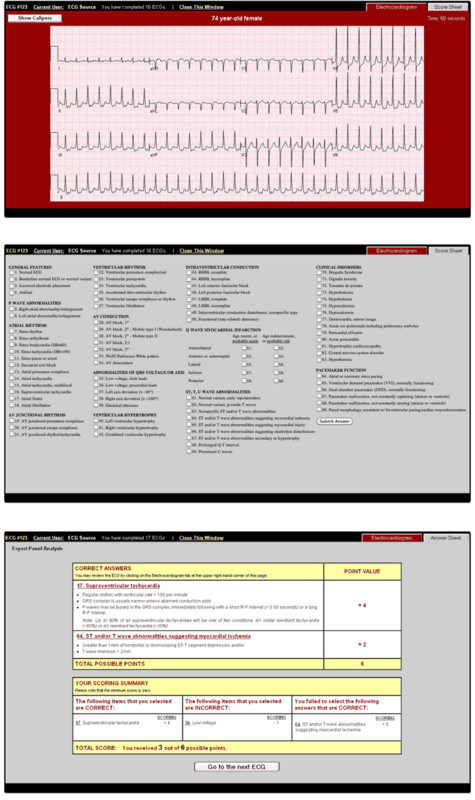 This high-yield database of coronary angiograms, ventriculograms, and aortograms has been developed to assist you in the recognition of cardiovascular pathology in the catheterization lab. Specific cases with associated cardiac images are presented in question format and the user has the opportunity to answer each case using a scoresheet similar to that used for the imaging section of the American Board of Internal Medicine (ABIM) Cardiovascular Disease Board Exam. There is no better resource available to simulate the imaging section of the Cardiovascular Disease Board Exam than CathSource. Cath Content. Designed for both specialists and trainees in the field of cardiovascular disease, this searchable index of cardiac catheterization and angiography topics includes educational images and videos in the following categories: Normal Coronary Anatomy, Anomalous Coronary Arteries, Coronary Artery Aneurysms, Standard Views of Angiography, Coarctation of the Aorta, Femoral Artery Access for Angiography, Radial Artery Access for Angiography, Fractional Flow Reserve (FFR), Hemodynamics: Intracardiac Pressures, Hemodynamics: Intracardiac Waveforms, Hemodynamics: Cardiac Output, Hemodynamics: Intracardiac Shunts, Hemodynamics: Aortic Stenosis, Hemodynamcis: Aortic Regurgitation, Hemodynamics: Mitral Stenosis, Hemodynamcis: Mitral Regurgitation, and Hemodynamcis: Constriction vs. Restriction. EchoSource. 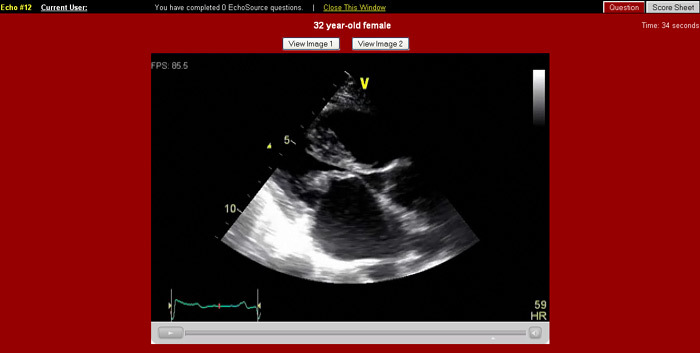 This high-yield database of transthoracic and transesophageal echocardiograms will assist you in the recognition of cardiovascular pathology in the echo lab. Specific cases with associated echo images are presented in question format and the user has the opportunity to answer each case using a scoresheet similar to that used for the imaging section of the American Board of Internal Medicine (ABIM) Cardiovascular Disease Board Exam. There is no better resource available to simulate the echo imaging section of the Cardiovascular Disease Board Exam than EchoSource.